Your favourite website has just won another award, which you will see below. 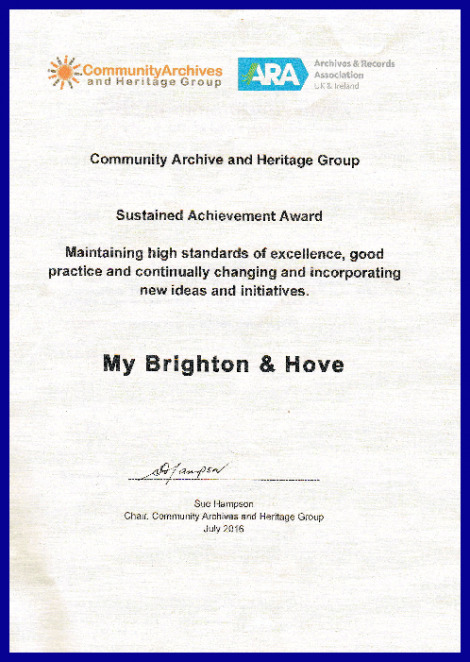 We are especially pleased because the ‘Sustained Achievement Award’ was issued by the Community Archives and Heritage Group and is awarded to groups that have worked hard and consistently achieved over at least a 10 year period. Such groups are likely to have something special in the way they ensure the continuity of their archive. This could be in terms of their ideas, methods, collections or the involvement of the whole community. I will not need to tell you how proud we all are that our hard work has been rewarded. But we also know that none of this would have been possible without your help. Your contributions and support have helped to make My Brighton and Hove so special. We are not just a website, we are a community of like minded people who are working together, to make a unique archive chronicling the life and history of the city we love. Well deserved, Jennifer and team. Many congratulations! My hearty congratulation to you all on your achievement. These awards don’t come without hard work, so well done. Congratulations, it is a great achievement. I know how hard everyone works to pull this together. You deserve to win, well done! Many, many congratulations. You are definitely my favourite website. I would be lost without you. I would just like to add my thanks and congratulations as well. As an old Brightonian and amateur genealogist I have found the site informative, interesting and invaluable. The work of the editorial team and the dedicated ‘regulars’ who are able to answer so many queries, often with little thanks, fully deserves this recognition. I congratulate and thank you all. That’s really great to have such well deserved recognition. I was one of the team that worked on the original ‘My Brighton’ project for Brighton Museum in 1993, so I am very pleased to see that all that hard work has paid off with the presentation to the present team of the award. Well Done all at My B&H! Brian and I are delighted that that this award has been conferred on you! We know how hard you work and how consistent all of your efforts are. Well done to Jennifer and all concerned – we are very proud of you! Congratulations to Jennifer and all your team. Well deserved. Well deserved award to Jennifer and the whole team. For me a nostalgic look back at my childhood from MBH website. Very well deserved in my opinion for a pleasant and interesting site and long may we all continue to contribute our stories and messages. Congratulations to all, and thank you for maintaining such a wonderful website. My best wishes and congratulations to all the team members. Long may the website continue to thrive. Congratulations to all of the team. Your kind assistance, Jennifer, is one of many things showing how genuine and deserving M.B.&H. is of receiving this award. There’s never been a dull moment on this site. Congratulations, Jennifer et al – and thank you. Heartfelt congratulations to you all. I often think of you all beavering away each week to educate and entertain us. May you continue to recieve all that you deserve. Many congratulations to all members of the My Brighton and Hove website team, and thank you for all your help and interesting articles over the years.